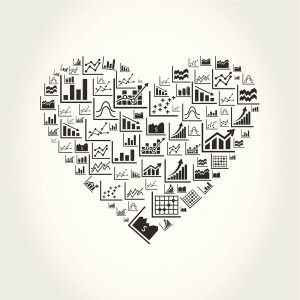 With Valentine’s Day right around the corner, we looked into some research statistics about love. Did you know as of 2011, there were 2,118,000 marriages (of a population of 311,591,917) in the United States? The nation’s marriage rate was 6.8 per 1,000 total populations and the divorce rate was 3.6 per 1,000 populations (of 44 reporting states and D.C.). Both marriage and divorce, however, are on the decline. One reason contributing to the decline of both marriage and divorce rates is that 7.5 million unmarried couples cohabit (U.S. Census, 2010) and of those couples 40% have children. According to the 2012 National Health Statistics Report, the median age of those getting married for the first time is 25.8 for women and 28.3 for men, which has increased since 1960 when the median age for women was 20 and 23 for men. Marriage rates may also be declining due to the practice Millennials seem to have adopted: baby first, marriage maybe. Millennials no longer see marriage as a necessity even though they still plan to spend their lives with their significant others. Nearly half of births to those under 35 are to those who are not married. If you are looking for a lady to love, travel to Seattle, Washington. It has the largest population of single women. Bloomington, Indiana has the highest percentage of single people in one city at 58%. Nevada has the highest divorce rate in the U.S. This is not surprising as Las Vegas is the wedding capital of the world, issuing an average of 120,000 marriage licenses annually. At 61%, Utah has the highest number of married couples. Connecticut has the lowest marriage rate and Massachusetts has the lowest divorce rate. Yankee Stadium in New York City has an average of one marriage proposal appearing on the scoreboard per game, while five times a year a frantic phone call is placed to cancel a scheduled proposal. This entry was posted on Wednesday, February 4th, 2015 at 8:40 pm. Both comments and pings are currently closed.